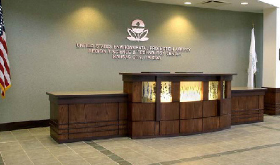 The Environmental Protection Agency (EPA) Science and Technology Building in Kansas City, Kan., consists of 72,000 square feet of state-of-the-art “green” laboratory space. Designed to be environmentally responsible and built on behalf of the General Services Administration (GSA), it serves as the regional science and laboratory facility for the EPA. After competing with 10 other potential developers, US Federal Properties (USFP) was awarded the development project. Selection criteria were based upon design, financial capabilities and an understanding of the client’s needs. The $22 million project was financed with revenue bonds over a 20-year issuance. The building was awarded the U.S. Green Building Council LEED (Leadership in Energy and Environmental Design) Gold Award, which was only the second Gold Award given to a laboratory in the nation.